ARLINGTON, Tex. — From the outset, Rangers manager Jeff Banister’s choice to start lefty Derek Holland instead of righty Colby Lewis in Game 4 of the American League Division Series against the righty-heavy Blue Jays appeared to be a head-scratcher. Before Holland could complete his first time through the lineup, it became an outright mismatch, as homers by righties Josh Donaldson, Chris Colabello and Kevin Pillar built the Blue Jays a 4–0 lead. The Jays won going away, 8–4, to send the series back to Toronto knotted at two games apiece, with a winner-take-all Game 5 set for Wednesday. Following Ben Revere’s game-opening bunt single, Holland left a 93-mph sinker in the center of the strike zone—“a non-executed pitch,” to call back Banister’s inimitable term from the aftermath of Game 3—and Donaldson clubbed it 381 feet to leftfield for his second homer of the series. Two batters later, Colabello followed by clouting another well-centered sinker 373 feet to rightfield, his first homer of the series. With one out in the second, Pillar connected for his first homer as well, with a 412-foot shot to leftfield. Holland was pulled two batters into the third inning, after walking Donaldson and yielding a double to Jose Bautista. He was charged with six runs, including the two inherited runners he left to Lewis, who came on for his first major-league relief appearance since Sept. 26, 2007 as a member of the A’s, and wobbled through three innings before departing. The two pitchers emerged as key parts of the Rangers’ staff during their three straight postseason appearances from 2010 to ’12 under Banister’s predecessor, Ron Washington, but their performances since then have been uneven. Lewis missed all of 2013 with a torn flexor tendon, struggled to a 5.18 ERA last year and pitched to a 4.66 ERA and 4.17 FIP in a team-high 204 2/3 innings in this one. Holland, who made just five starts last year after undergoing microfracture surgery on his left knee, left his first start this year with a shoulder strain and made just 10 turns, pitching to a 4.91 ERA and 5.03 FIP. Each pitcher was roughed up in six September starts, Holland for a 6.19 ERA/5.69 FIP, Lewis for a 5.45 ERA/3.71 FIP. Still, the two pitchers’ 2015 performances against righties—.264/.337/.511 with 10 HR in 202 plate appearances for Holland, .260/.301/.416 with 13 homers in 392 PA for Lewis—appeared to point to the latter against a Toronto team that set a single-season record with 200 homers by righthanded batters. Donaldson, Bautista, Edwin Encarnacion, Troy Tulowitzki, Colabello, Pillar and Russell Martin all swing from the right side; that group combined to go 4-for-8 with three homers, a double and a walk before Holland departed, for a combined slugging percentage of 1.875. Ouch. Gibbons did his part to make sure Banister wasn’t alone in leaving himself open to criticism with regards to his pitching choices—not that any manager is, given the microscope of the postseason. With a 7–1 lead, two outs and one on in the fifth inning, he not only pulled starter R.A. Dickey after just 78 pitches, but called upon ace David Price in relief, then allowed him to pitch three innings while throwing 50 pitches, ruling him out of a Game 5 start, with Marcus Stroman going instead. Dickey scattered five hits in 4 2/3 innings without walking a batter and striking out three. The only run he allowed came in the third inning via singles by Shin-Soo Choo and Adrian Beltre (a late addition to the lineup after missing Games 2 and 3 due to back spasms) and a run-scoring wild pitch. But with Choo, who had already collected two of the five hits off Dickey to run his career line to 6 for 13 against the knuckleballer, due up a third time in the fifth, Gibbons looked instead to Price for a matchup he had considered the night before. 2015 MLB playoff flowchart: Which team should you be rooting for? ​With Brett Cecil lost for the season after suffering a torn calf in Game 2, and Aaron Loup having left the team before Game 4 due to a family issue, Price was the bullpen’s lone lefty, but Gibbons was determined to get mileage out of him. After retiring Choo on a first-pitch fly ball to centerfield, Price set down four of the next five batters, erasing Elvis Andrus, who had singled, with a double play. After that, however, five of the next eight Rangers reached base, with a Rougned Odor double and a Robinson Chirinos single adding a run in the seventh, and singles by Choo, Prince Fielder and Andrus, plus a productive groundout by Mitch Moreland, adding two in the eighth to trim the lead to 8–4. By working Price as long as he did, Gibbons left the Game 5 start in the hands of Stroman, a scenario that he had hinted at several times over the past two days, particularly in connection to his dearth of lefty relievers. The 24-year-old righty, who recovered from a torn ACL in March to make four September starts with a 1.67 ERA, allowed four runs (three earned) in the first seven innings of the 14-inning Game 2 marathon, a start he made on eight days’ rest. 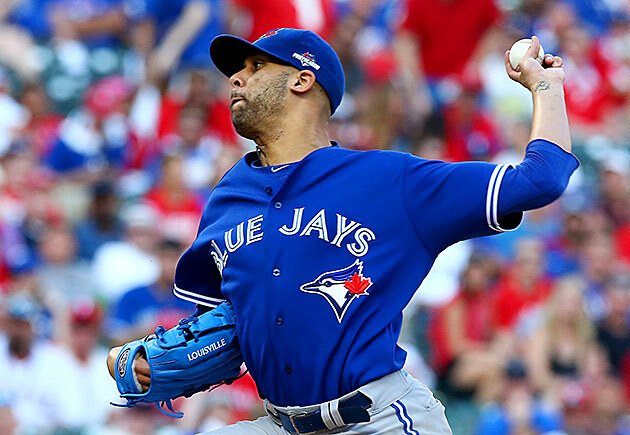 Price showed a bit more rust in Game 1, allowing five runs in seven innings on 11 days’ rest. In bypassing the catalyst for the Blue Jays’ late-season turnaround and the potential AL Cy Young winner, Gibbons has left himself open to second-guessing, but a manager whose team had its back to the wall after falling into an 0–2 hole will take it. So will Banister, who has the more clear-cut choice for Game 5 in Cole Hamels.